What is the temperature of the Earth's crust? As you may recall learning in geology class, the Earth is made up of distinct layers. The further one goes towards the center of the planet, the more intense the heat and pressure becomes. Luckily, for those of us living on the crust (the outermost layer, where all life lives) the temperature is relatively steady and pleasant. In fact, one of the things that makes planet Earth habitable is the fact that the planet is close enough to our sun to receive enough energy to stay warm. What's more, its "surface temperatures" are warm enough to sustain liquid water, the key to life as we know it. But the temperature of Earth's crust also varies considerably depending on where and when you are measuring it. As a terrestrial planet, Earth is composed of silicate rocks and metals which are differentiated between a solid metal core, a molten outer core, and a silicate mantle and crust. The inner core has an estimated radius of 1,220 km, while the outer core extends beyond it to a radius of about 3,400 km. 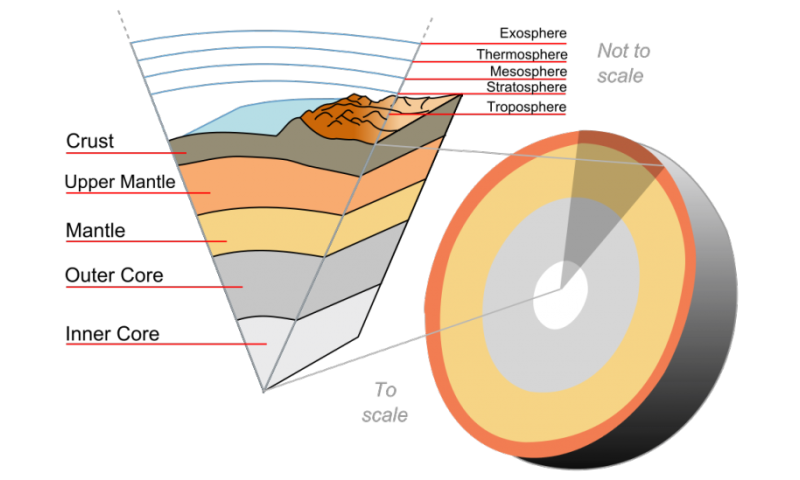 Extending outwards from the core are the mantle and the crust. 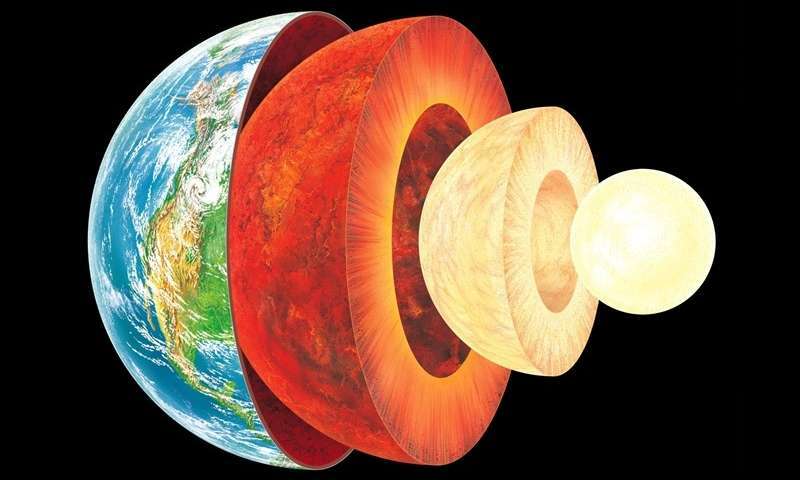 Earth's mantle extends to a depth of 2,890 km beneath the surface, making it the thickest layer of Earth. This layer is composed of silicate rocks that are rich in iron and magnesium relative to the overlying crust. Although solid, the high temperatures within the mantle cause the silicate material to be sufficiently ductile that it can flow on very long timescales. The upper layer of the mantle is divided into the lithospheric mantle (aka. the lithosphere) and the asthenosphere. The former consists of the crust and the cold, rigid, top part of the upper mantle (which the tectonic plates are composed of) while the asthenosphere is the relatively low-viscosity layer on which the lithosphere rides. The crust is the absolute outermost layer of the Earth, which constitutes just 1% of the Earth's total mass. The thickness of the crust varies depending on where the measurements are taken, ranging from 30 km thick where there are continents to just 5 km thick beneath the oceans. The crust is composed of a variety of igneous, metamorphic and sedimentary rocks and is arranged in a series of tectonic plates. These plates float above the Earth's mantle, and it's believed that convection in the mantle causes the plates to be in constant motion. Sometimes these plates collide, pull apart, or slide alongside each other; resulting in convergent boundaries, divergent boundaries, and transform boundaries. In the case of convergent boundaries, subduction zones are often the result, where the heavier plate slips under the lighter plate – forming a deep trench. In the case of divergent boundaries, these are formed when tectonic plates pull apart, forming rift valleys on the seafloor. When this happens, magma wells up in the rift as the old crust pulls itself in opposite directions, where it is cooled by seawater to form new crust. A transform boundary is formed when tectonic plates slide horizontally and parts get stuck at points of contact. Stress builds in these areas as the rest of the plates continue to move, which causes the rock to break or slip, suddenly lurching the plates forward and causing earthquakes. These areas of breakage or slippage are called faults. 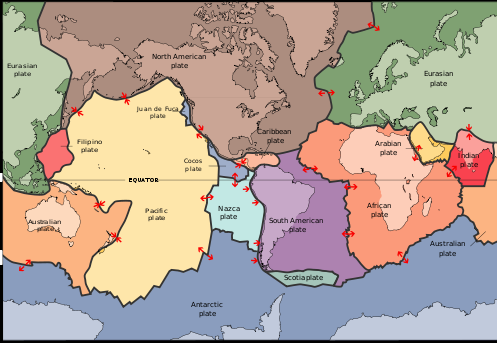 Taken together, these three types of tectonic plate action are what is responsible for shaping the Earth's crust and leading to periodic renewal of its surface over the course of millions of years. The temperature of the Earth's crust ranges considerably. At its outer edge, where it meets the atmosphere, the crust's temperature is the same temperature as that of the air. So, it might be as hot as 35 °C in the desert and below freezing in Antarctica. On average, the surface of the Earth's crust experiences temperatures of about 14°C. However, the hottest temperature ever recorded was 70.7°C (159°F), which was taken in the Lut Desert of Iran as part of a global temperature survey conducted by scientists at NASA's Earth Observatory. Meanwhile, the coldest temperature ever recorded on Earth was measured at the Soviet Vostok Station on the Antarctic Plateau – which reached an historic low of -89.2°C (-129°F) on July 21st, 1983. That's quite the range already. But consider the fact that the majority of the Earth's crust lies beneath the oceans. Far from the sun, temperatures can reach as low as 0-3° C (32-37.5° F) where the water reaches the crust. Still, a lot balmier than a cold night in Antarctica! And as geologists have known for some time, if you dig down into the continental crust, temperatures will go up. For example, the deepest mine in the world is currently the TauTona gold mine in South Africa, measuring 3.9 km deep. At the bottom of the mine, temperatures reach a sweltering 55 °C, which requires that air conditioning be provided so that it's comfortable for the miners to work all day. So in the end, the temperature of Earth's crust varies considerably. It's average surface temperature which depends on whether it is being taken on dry land or beneath the sea. And depending on the location, seasons, and time of day, it can range from sweltering to freezing cold! And yet, Earth's crust remains the only place in the solar system where temperatures are stable enough that life can continue to thrive on it. Add to that our viable atmosphere and protective magnetosphere, and we really should consider ourselves to be the lucky ones!